Soldiers clash with opposition supporters as EU sees several problems in Zimbabwe votes – Royal Times of Nigeria. 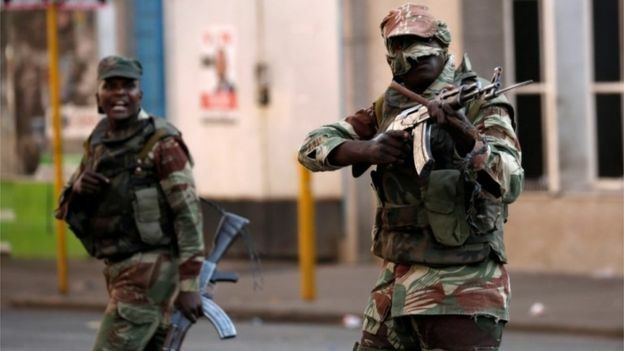 Automatic gunfire crackled in the streets of Harare on Wednesday as soldiers stepped in to disperse protesters who had clashed with police after the main opposition leader accused the ruling party of trying to rig the result of Zimbabwe’s election. European Union observers also said the elections had several problems, including media bias, voter intimidation and mistrust in the electoral commission and questioned delays in releasing the presidential results. The leader of the opposition Movement for Democratic Change, Nelson Chamisa, said on Twitter he had won the “popular vote” in Monday’s election, in which he challenged Robert Mugabe’s successor, Emmerson Mnangagwa from the ruling Zanu-PF party. With three seats yet to be declared, ZANU-PF has one hundred and fifty-four seats compared to sixty-one for the MDC, meaning the ruling party achieved a two-thirds majority which would allow it to change the constitution at will. Opposition leader Chamisa accused the ZANU-PF of trying to steal the election. He accused the commission of releasing the parliamentary results first to prepare Zimbabweans for a Mnangagwa victory.